Ruthenium is a chemical element with symbol Ru and atomic number 44. It is a rare transition metal belonging to the platinum group of the periodic table. Like the other metals of the platinum group, ruthenium is inert to most other chemicals. Russian-born scientist of Baltic-German ancestry Karl Ernst Claus discovered the element in 1844 at Kazan State University and named it after the Latin name of his homeland, Ruthenia. Ruthenium is usually found as a minor component of platinum ores; the annual production has risen from about 19 tonnes in 2009  to some 35.5 tonnes in 2017. Most ruthenium produced is used in wear-resistant electrical contacts and thick-film resistors. A minor application for ruthenium is in platinum alloys and as a chemistry catalyst. A new application of ruthenium is as the capping layer for extreme ultraviolet photomasks. 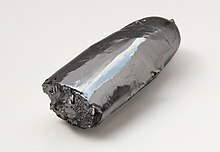 Ruthenium is generally found in ores with the other platinum group metals in the Ural Mountains and in North and South America. Small but commercially important quantities are also found in pentlandite extracted from Sudbury, Ontario and in pyroxenite deposits in South Africa. Whereas all other group 8 elements have 2 electrons in the outermost shell, in ruthenium, the outermost shell has only one electron (the final electron is in a lower shell). 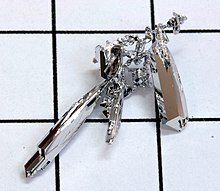 This anomaly is observed in the neighboring metals niobium (41), molybdenum (42), and rhodium (45). 4), is not attacked by acids (even aqua regia) but is attacked by halogens at high temperatures. Indeed, ruthenium is most readily attacked by oxidizing agents. Small amounts of ruthenium can increase the hardness of platinum and palladium. The corrosion resistance of titanium is increased markedly by the addition of a small amount of ruthenium. The metal can be plated by electroplating and by thermal decomposition. A ruthenium-molybdenum alloy is known to be superconductive at temperatures below 10.6 K. Ruthenium is the last of the 4d transition metals that can assume the group oxidation state +8, and even then it is less stable there than the heavier congener osmium: this is the first group from the left of the table where the second and third-row transition metals display notable differences in chemical behavior. Like iron but unlike osmium, ruthenium can form aqueous cations in its lower oxidation states of +2 and +3. Roughly 12 tonnes of ruthenium are mined each year with world reserves estimated at 5,000 tonnes. The composition of the mined platinum group metal (PGM) mixtures varies widely, depending on the geochemical formation. For example, the PGMs mined in South Africa contain on average 11% ruthenium while the PGMs mined in the former USSR contain only 2% (1992). Ruthenium, osmium, and iridium are considered the minor platinum group metals. Grubbs' catalyst, which earned a Nobel Prize for its inventor, is used in alkene metathesis reactions. Jöns Berzelius and Gottfried Osann nearly discovered ruthenium in 1827. They examined residues that were left after dissolving crude platinum from the Ural Mountains in aqua regia. Berzelius did not find any unusual metals, but Osann thought he found three new metals, which he called pluranium, ruthenium, and polinium. This discrepancy led to a long-standing controversy between Berzelius and Osann about the composition of the residues. As Osann was not able to repeat his isolation of ruthenium, he eventually relinquished his claims. The name "ruthenium" was chosen by Osann because the analysed samples stemmed from the Ural Mountains in Russia. The name itself derives from Ruthenia, the Latin word for Rus', a historical area that included present-day Ukraine, Belarus, western Russia, and parts of Slovakia and Poland. 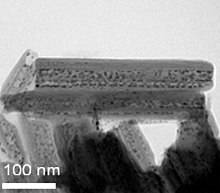 Halloysite nanotubes intercalated with ruthenium catalytic nanoparticles. Many ruthenium-containing compounds exhibit useful catalytic properties. The catalysts are conveniently divided into those that are soluble in the reaction medium, homogeneous catalysts, and those that are not, which are called heterogeneous catalysts. Ruthenium nanoparticles can be formed inside halloysite. This abundant mineral naturally has a structure of rolled nanosheets (nanotubes), which can support both the Ru nanocluster synthesis and its products for subsequent use in industrial catalysis. Solutions containing ruthenium trichloride are highly active for olefin metathesis. Such catalysts are used commercially for the production of polynorbornene for example. Well defined ruthenium carbene and alkylidene complexes show comparable reactivity and provide mechanistic insights into the industrial processes. The Grubbs' catalysts for example have been employed in the preparation of drugs and advanced materials. RuCl3-catalyzed ring-opening metathesis polymerization reaction giving polynorbornene..
A Nobel Prize in Chemistry was awarded in 2001 to Ryōji Noyori for contributions to the field of asymmetric hydrogenation. In 2012, Masaaki Kitano and associates, working with an organic ruthenium catalyst, demonstrated ammonia synthesis using a stable electride as an electron donor and reversible hydrogen store. Small-scale, intermittent production of ammonia, for local agricultural use, may be a viable substitute for electrical grid attachment as a sink for power generated by wind turbines in isolated rural installations. Ruthenium-promoted cobalt catalysts are used in Fischer-Tropsch synthesis. Many ruthenium-based oxides show very unusual properties, such as a quantum critical point behavior, exotic superconductivity (in its strontium ruthenate form), and high-temperature ferromagnetism. ^ "Ruthenium: ruthenium(I) fluoride compound data". OpenMOPAC.net. Retrieved 10 December 2007. ^ "Platinum–Group Metals" (PDF). U.S. Geological Survey, Mineral Commodity Summaries. January 2007. Retrieved 9 September 2008. ^ a b c Hamond, C.R. "The elements", in Lide, D. R., ed. (2005). CRC Handbook of Chemistry and Physics (86th ed.). Boca Raton (FL): CRC Press. ISBN 0-8493-0486-5. ^ a b c d Emsley, J. (2003). "Ruthenium". Nature's Building Blocks: An A-Z Guide to the Elements. Oxford, England, UK: Oxford University Press. pp. 368–370. ISBN 978-0-19-850340-8. ^ a b c George, Micheal W. "2006 Minerals Yearbook: Platinum-Group Metals" (PDF). United States Geological Survey USGS. Retrieved 16 September 2008. ^ a b "Commodity Report: Platinum-Group Metals" (PDF). United States Geological Survey USGS. Retrieved 16 September 2008. ^ Hartman, H. L.; Britton, S. G., eds. (1992). SME mining engineering handbook. Littleton, Colo.: Society for Mining, Metallurgy, and Exploration. p. 69. ISBN 978-0-87335-100-3. ^ Harris, Donald C.; Cabri, L. J. (1973). "The nomenclature of the natural alloys of osmium, iridium and ruthenium based on new compositional data of alloys from world-wide occurrences". The Canadian Mineralogist. 12 (2): 104–112. ^ Renner, H.; Schlamp, G.; Kleinwächter, I.; Drost, E.; Lüschow, H. M.; Tews, P.; Panster, P.; Diehl, M.; Lang, J.; Kreuzer, T.; Knödler, A.; Starz, K. A.; Dermann, K.; Rothaut, J.; Drieselman, R. (2002). "Platinum group metals and compounds". Ullmann's Encyclopedia of Industrial Chemistry. Wiley. doi:10.1002/14356007.a21_075. ISBN 978-3527306732. ^ Seymour, R. J.; O'Farrelly, J. I. (2001). "Platinum-group metals". Kirk Othmer Encyclopedia of Chemical Technology. Wiley. doi:10.1002/0471238961.1612012019052513.a01.pub2. ISBN 978-0471238966. ^ a b c Cotton, Simon (1997). Chemistry of Precious Metals. Springer-Verlag New York, LLC. pp. 1–20. ISBN 978-0-7514-0413-5. ^ a b Hunt, L. B.; Lever, F. M. (1969). "Platinum Metals: A Survey of Productive Resources to industrial Uses" (PDF). Platinum Metals Review. 13 (4): 126–138. ^ Brown, G.M. ; Butler, J.H. (1997). "New method for the characterization of domain morphology of polymer blends using ruthenium tetroxide staining and low voltage scanning electron microscopy (LVSEM)". Polymer. 38 (15): 3937. doi:10.1016/S0032-3861(96)00962-7. ^ a b Weeks, Mary Elvira (1932). "The discovery of the elements. VIII. The platinum metals". Journal of Chemical Education. 9 (6): 1017. Bibcode:1932JChEd...9.1017W. doi:10.1021/ed009p1017. ^ "New Metals in the Uralian Platina". The Philosophical Magazine. 2 (11): 391–392. 1827. doi:10.1080/14786442708674516. ^ a b c d e Pitchkov, V. N. (1996). "The Discovery of Ruthenium". Platinum Metals Review. 40 (4): 181–188. ^ Osann, Gottfried (1829). "Berichtigung, meine Untersuchung des uralschen Platins betreffend". Poggendorffs Annalen der Physik und Chemie. 15: 158. doi:10.1002/andp.18290910119. ^ Osann, Gottfried (1828). "Fortsetzung der Untersuchung des Platins vom Ural". Poggendorffs Annalen der Physik und Chemie. 14 (6): 283–297. Bibcode:1828AnP....89..283O. doi:10.1002/andp.18280890609. The original sentence on p. 339 reads: "Da dieses Metall, welches ich nach den so eben beschriebenen Eigenschaften als ein neues glaube annehmen zu müssen, sich in größerer Menge als das früher erwähnte in dem uralschen Platin befindet, und auch durch seinen schönen, dem Golde ähnlichen metallischen Glanz sich mehr empfiehlt, so glaube ich, daß der Vorschlag, das zuerst aufgefundene neue Metall Ruthenium zu nennen, besser auf dieses angewendet werden könne." ^ Claus, Karl (1845). "О способе добывания чистой платины из руд". Горный журнал (Mining Journal) (in Russian). 7 (3): 157–163. ^ Rao, C; Trivedi, D. (2005). "Chemical and electrochemical depositions of platinum group metals and their applications". Coordination Chemistry Reviews. 249 (5–6): 613. doi:10.1016/j.ccr.2004.08.015. ^ Weisberg, A (1999). "Ruthenium plating". Metal Finishing. 97: 297. doi:10.1016/S0026-0576(00)83089-5. ^ Prepared under the direction of the ASM International Handbook Committee; Merrill L. Minges, technical chairman (1989). Electronic materials handbook. Materials Park, OH: ASM International. p. 184. ISBN 978-0-87170-285-2. ^ Busana, M. G.; Prudenziati, M.; Hormadaly, J. (2006). "Microstructure development and electrical properties of RuO2-based lead-free thick film resistors". Journal of Materials Science: Materials in Electronics. 17 (11): 951. doi:10.1007/s10854-006-0036-x. ^ Rane, Sunit; Prudenziati, Maria; Morten, Bruno (2007). "Environment friendly perovskite ruthenate based thick film resistors". Materials Letters. 61 (2): 595. doi:10.1016/j.matlet.2006.05.015. ^ Slade, Paul G., ed. (1999). Electrical contacts : principles and applications. New York, NY: Dekker. pp. 184, 345. ISBN 978-0-8247-1934-0. ^ Schutz, R. W. (1996). "Ruthenium Enhanced Titanium Alloys" (PDF). Platinum Metals Review. 40 (2): 54–61. ^ "Fourth generation nickel base single crystal superalloy. TMS-138 / 138A" (PDF). High Temperature Materials Center, National Institute for Materials Science, Japan. July 2006. ^ Koizumi, Yutaka; et al. "Development of a Next-Generation Ni-base Single Crystal Superalloy" (PDF). Proceedings of the International Gas Turbine Congress, Tokyo 2–7 November 2003. ^ Walston, S.; Cetel, A.; MacKay, R.; O'Hara, K.; Duhl, D.; Dreshfield, R. (December 2004). "Joint Development of a Fourth Generation Single Crystal Superalloy" (PDF). NASA. ^ Bondarenko, Yu. A.; Kablov, E. N.; Surova, V. A.; Echin, A. B. (2006). "Effect of high-gradient directed crystallization on the structure and properties of rhenium-bearing single-crystal alloy". Metal Science and Heat Treatment. 48 (7–8): 360. Bibcode:2006MSHT...48..360B. doi:10.1007/s11041-006-0099-6. ^ Mottishaw, J. (1999). "Notes from the Nib Works—Where's the Iridium?". The PENnant. XIII (2). ^ Cardarelli, François (2008). "Dimensionally Stable Anodes (DSA) for Chlorine Evolution". Materials Handbook: A Concise Desktop Reference. London: Springer. pp. 581–582. ISBN 978-1-84628-668-1. ^ Varney, Mark S. (2000). "Oxygen Microoptode". Chemical sensors in oceanography. Amsterdam: Gordon & Breach. p. 150. ISBN 978-90-5699-255-2. ^ Hayat, M. A. (1993). "Ruthenium red". Stains and cytochemical methods. New York, NY: Plenum Press. pp. 305–310. ISBN 978-0-306-44294-0. ^ Wiegel, T. (1997). Radiotherapy of ocular disease, Ausgabe 13020. Basel, Freiburg: Karger. ISBN 978-3-8055-6392-5. ^ Richards, A. D.; Rodger, A. (2007). "Synthetic metallomolecules as agents for the control of DNA structure". Chem. Soc. Rev. 36 (3): 471–483. doi:10.1039/b609495c. PMID 17325786. ^ NCJRS Abstract – National Criminal Justice Reference Service. Ncjrs.gov. Retrieved on 2017-02-28. ^ a b Vinokurov, Vladimir A.; Stavitskaya, Anna V.; Chudakov, Yaroslav A.; Ivanov, Evgenii V.; Shrestha, Lok Kumar; Ariga, Katsuhiko; Darrat, Yusuf A.; Lvov, Yuri M. (2017). "Formation of metal clusters in halloysite clay nanotubes". Science and Technology of Advanced Materials. 18 (1): 147–151. Bibcode:2017STAdM..18..147V. doi:10.1080/14686996.2016.1278352. PMC 5402758. PMID 28458738. ^ Fürstner, Alois (2000). "Olefin Metathesis and Beyond". Angewandte Chemie International Edition. 39 (17): 3012–3043. doi:10.1002/1521-3773(20000901)39:17<3012::AID-ANIE3012>3.0.CO;2-G. PMID 11028025. ^ Chen, Fei (2015). "Synthesis of Optically Active 1,2,3,4-Tetrahydroquinolines via Asymmetric Hydrogenation Using Iridium-Diamine Catalyst". Org. Synth. 92: 213–226. doi:10.15227/orgsyn.092.0213. ^ Kitano, Masaaki; Inoue, Yasunori; Yamazaki, Youhei; Hayashi, Fumitaka; Kanbara, Shinji; Matsuishi, Satoru; Yokoyama, Toshiharu; Kim, Sung-Wng; Hara, Michikazu; Hosono, Hideo (2012). "Ammonia synthesis using a stable electride as an electron donor and reversible hydrogen store". Nature Chemistry. 4 (11): 934–940. Bibcode:2012NatCh...4..934K. doi:10.1038/nchem.1476. PMID 23089869. ^ Schulz, Hans (1999). "Short history and present trends of Fischer–Tropsch synthesis". Applied Catalysis A: General. 186 (1–2): 3–12. doi:10.1016/S0926-860X(99)00160-X. ^ Kuang, Daibin; Ito, Seigo; Wenger, Bernard; Klein, Cedric; Moser, Jacques-E; Humphry-Baker, Robin; Zakeeruddin, Shaik M.; Grätzel, Michael (2006). "High Molar Extinction Coefficient Heteroleptic Ruthenium Complexes for Thin Film Dye-Sensitized Solar Cells". Journal of the American Chemical Society. 128 (12): 4146–54. doi:10.1021/ja058540p. PMID 16551124. ^ Perry, R.; Kitagawa, K.; Grigera, S.; Borzi, R.; MacKenzie, A.; Ishida, K.; Maeno, Y. (2004). "Multiple First-Order Metamagnetic Transitions and Quantum Oscillations in Ultrapure Sr.3Ru2O7". Physical Review Letters. 92 (16): 166602. arXiv:cond-mat/0401371. Bibcode:2004PhRvL..92p6602P. doi:10.1103/PhysRevLett.92.166602. PMID 15169251. ^ Maeno, Yoshiteru; Rice, T. Maurice; Sigrist, Manfred (2001). "The Intriguing Superconductivity of Strontium Ruthenate" (PDF). Physics Today. 54 (1): 42. Bibcode:2001PhT....54a..42M. doi:10.1063/1.1349611. ^ Shlyk, Larysa; Kryukov, Sergiy; Schüpp-Niewa, Barbara; Niewa, Rainer; De Long, Lance E. (2008). "High-Temperature Ferromagnetism and Tunable Semiconductivity of (Ba, Sr)M2±xRu4∓xO11 (M = Fe, Co): A New Paradigm for Spintronics". Advanced Materials. 20 (7): 1315. doi:10.1002/adma.200701951.